Kevin Wieging, president of Ultra Sound Special Events in Delphos, stands inside his new six-lane indoor axe throwing range. 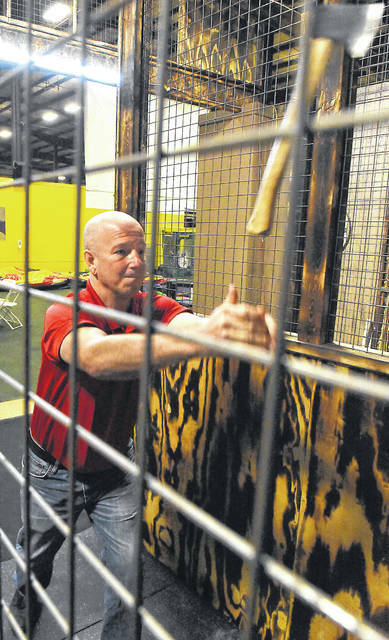 Kevin Wieging, president of Ultra Sound Special Events in Delphos, stands inside his new six-lane indoor axe throwing range. 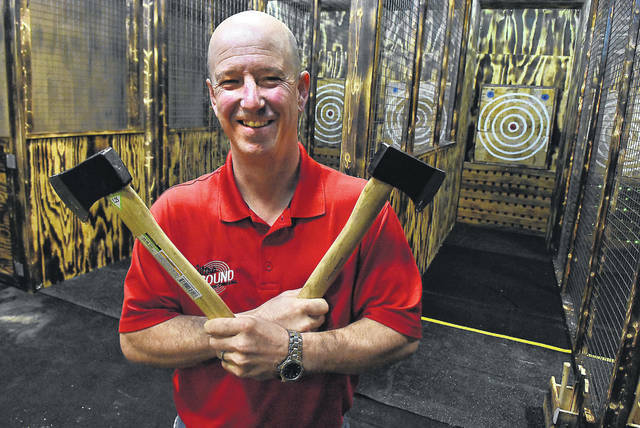 Kevin Wieging, president of Ultra Sound Special Events in Delphos, throws an axe inside his new indoor axe throwing range. 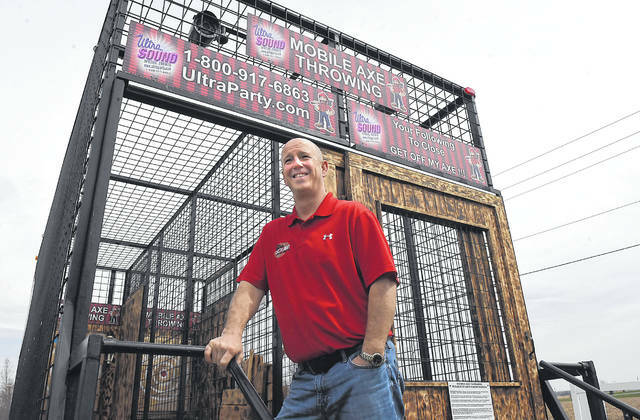 Kevin Wieging, president of Ultra Sound Special Events in Delphos, with his portable two-lane mobile axe throwing range. DELPHOS — Ever thrown an axe for fun? You’ll soon have the chance when The Axe Cave opens in May. The trend, which has emerged in major cities, will soon be available not far outside Lima in Delphos. “It’s kind of like darts and it’s kind of like bowling,” said Kevin Wieging, president of UltraSound Special Events, which owns the Kangaroo Cave and The Axe Cave. Participants reserve a lane for up to six people, who then have 10 throws apiece. Teams are encouraged to participate in duels, or one-on-one matches, to see who throws the highest score. For safety, each lane is separated by wire fencing to prevent stray axes from hitting other contestants. Likewise, an axe-throwing coach will work with couples and parties on their throwing technique. There are two basic throwing stances — one- or two-handed. In both cases, the thrower will raise the axe over their head, swing their arm forward and release. Timing is important, as Wieging explains that the axe needs to rotate in order to hit and stick to the target. There will be only one axe and one thrower per lane, for safety purposes. The Axe Cave is located inside the Kangaroo Cave, 4747 Good Road, a family entertainment center in Delphos. “Now this is something for mom and dad to do while their kids can enjoy the same type of atmosphere doing different stuff,” Wieging said. There’s a mobile axe throwing cage, too, available for private parties and events. “(You’re) still having the axe experience but not having to go to a brick and mortar location,” Wieging said. While The Axe Cave won’t open to the public until early May, Wieging is planning an open house from 11 a.m. to 3 p.m. Friday, April 19.